With XAT 2019 exam approaching in just a couple of days, it is now time to fully accelerate your preparation in top gear for this important Exam of XAT. 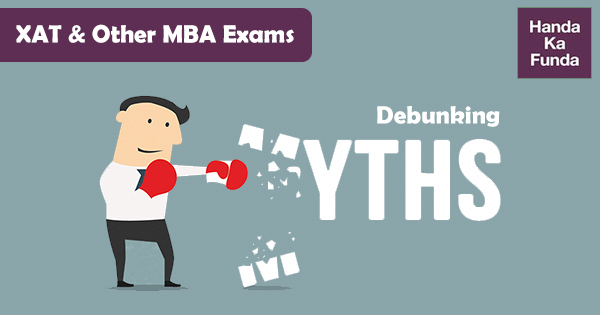 Today, I will be debunking few popular myths related to MBA entrance exams, especially of XAT. Myth1#: – Although XAT scorecard is accepted by many B schools, I will never have the same advantage of a good CAT scorecard. Reality: – The exam of CAT is extremely vital to get into IIM’s. However, do not hold other top B schools as less important and competent than the IIM’s. If you are willing to make a successful career after MBA, XAT scorecard will provide you enough options to land in a highly reputed Business school across India. As per sources, there are more than 140 B schools which allow admission on the basis of XAT out of which, getting into the top ones are extremely difficult. Myth2#: – Just because I got selected on the basis of XAT, I will end up with a high paying job after my post-graduation. Reality: – Top tier exams like CAT/XAT and various other entrance exams like that of IIT, only provides you a powerful platform. The ability to compete and gain valuable experience and knowledge lies completely within you. Over the course of post-graduation, if your performance would be highly good, you will have plethora of opportunities to make a successful living. Myth3#: – Joining a good coaching institute will give me an advantage over others who do not. Reality: – This belief has been circulating around since decades. The reality is, joining even a reputed institute (which isn’t necessary honestly) is just the initial step for the goal of clearing XAT/CAT. Also the fact is, coaching institutes will often advertise themselves in a way to appease the masses. You have to accept the fact that preparing for exams like CAT and even XAT requires lot of effort. Only self-study and practice can help you and not coaching institutes. Myth4#: – The more tests I attempt, the higher will be my chances for getting into IIM’s and top business schools. Reality: – Nothing could be further from the truth. Mock Tests are very important, however, assessing your strengths and weakness from it are even more important. If you have sufficient time, it is always advisable to utilize the extra time in solving mock tests. However, you need to keep the assumption out of your head that just because are attempting too many series, you are nearing towards your goal of clearing XAT. Attempting and analyzing (Unlearning and learning new) are both different things. You need to be good at the latter. Reality: – Honestly, I do agree with the above fact. Yes, they are difficult to crack. But one thing needs to be observed here. The syllabus usually surrounds the general subjects till 10th standard. If 10th standard subjects are difficult for you to prepare, then I have nothing to say. With sufficient time, you can prepare very well for all MBA entrance exams. Conclusion: – It’s very important to stay focused and positive about your preparation. Contemplating on such myths will only hamper your motivation levels and may not allow you to give that extra push that is needed to outscore your fellow students in the exams. Remember the marks are calculated in percentile. In order to clear the paper, you need to clear cut off for each section. However, after that you need to have just more marks than your peers. About Us: – Looking to prepare for CAT/XAT and other banking exams? We provide digital medium in the form of Online Videos for your preparation. All the topics are covered in significant depth.